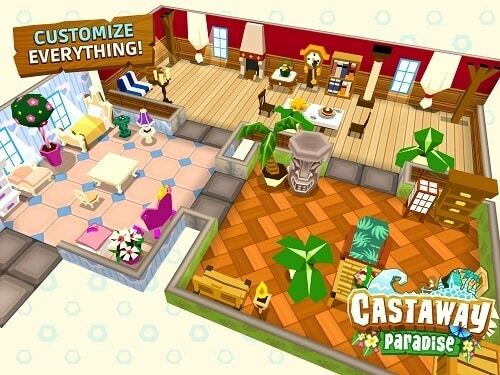 Castaway Paradise brings an Animal Crossing like experience to your mobile device with a game set on your own tropical island. From helping the animal like villagers to catching fish and planting crops there is a lot to do in this free to play experience (on mobile devices) with a paid offering on PC, Mac and consoles. At the start of the game players will land on the shores of a tropical island and be introduced to Viktoria, a pig lady. She’ll ask you if you want to play as a boy or girl with no customisation available at this point (although there is plenty available later on in the game). After some brief tutorial orientated missions handed to you from Viktoria you’ll be given more freedom of the island. 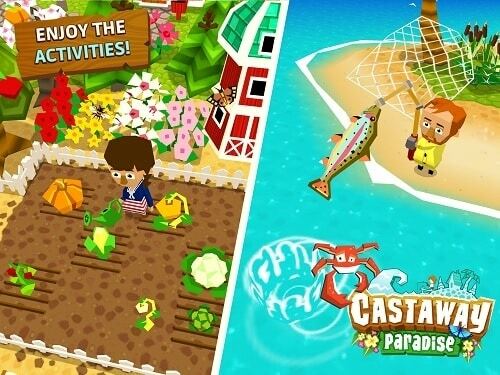 The core focus of Castaway Paradise is on helping the inhabitants by completing various quests for them. The game packs in well over a hundred quests that range from simple to more long winded affairs involving multiple steps. Many of these quests will also improve the island from repairing a bridge to planting trees your island will quickly become your own virtual paradise. Outside of questing for characters the game is a sandbox experience with activities ranging from bug catching, fishing, farming, playing the stock market, customising your own house and dressing up your character in all sorts of outfits. Each of these side activities is packed full of detail with each having a collect them all approach (such as catching all butterflies or fish). The similarities to the much loved Animal Crossing series are obvious throughout the entire game and while that’s great for fans of the series it would have been nice to see the game craft its own identity. Animal Crossing fan or not you can’t pass up this enjoyable and rich simulation experience that puts many other mobile options in this space to shame. Catch fish and butterflies to collect them all. Play the stock market and create a luxurious house. Compete with friends through Facebook connectivity. Repair and revive the tropical island.